How odd it feels to be blogging again, ever so briefly, about Second Life. I have returned to the virtual world for a couple of VWER meetings and am even considering updating Iggy's avatar shape and skin. His relatively new dreadlocks demand it! Yet following a post I spotted in New World Notes, about Linden Lab's deciding to lower set-up fees for sims, I thought my two cents might contribute to the debate. 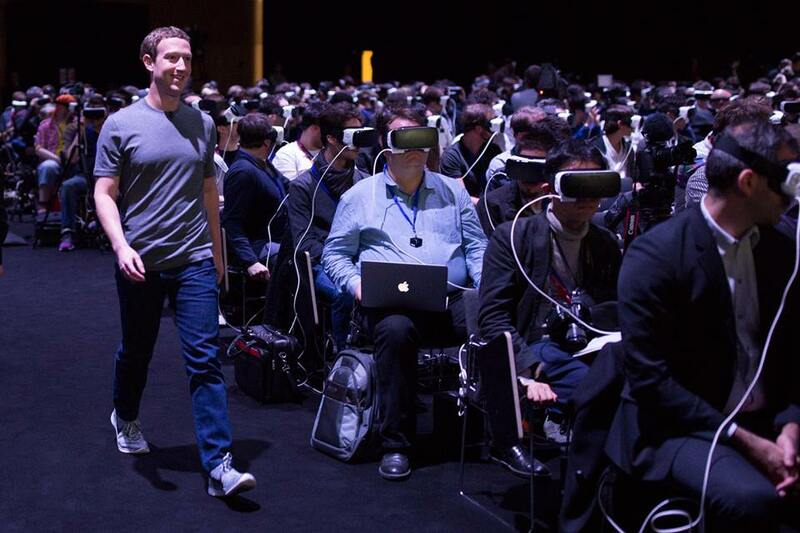 "democratize virtual reality as a creative medium. It will empower people to easily create, share, and monetize their own multi-user, interactive virtual experiences, without requiring engineering resources. The platform will enable professional-level quality and performance with exceptional visual fidelity, 3D audio, and physics simulation." These promises are at odds. If Sansar lets us "easily" create such 3D content using our Occulus Rift headsets, it would require tools far simpler than Blender or Maya. Those high-end tools then put Sansar out of reach of many educators I know. Motion-sickness issues for the Rift may be easier to resolve than those about the tools needed for content creation. I reserve judgement on the "native building options" the Lab mentions. Perhaps in-world creation for ordinary mortals and student teams will endure, freed from the cumbersome permissions system that hamstrings SL team-builds. Meanwhile, the Lab's original virtual world chugs along shedding 20-30 sims per week of landmass, rather like an iceberg drifting with the Gulf Stream. The Lindens do no, and probably can not, do the one thing that would democratize Second Life again: cut monthly tiers deeply for ordinary users. At $25 per month for a homestead and $50 for a full sim, I'd rent server space to make a roleplaying game from my twisted imagination. I could then take advantage of SL's rich marketplace, finely designed mesh avatars and other content. Linden Lab launched its Experience Keys program precisely for content like what I envision. Unlike 3D creations at Turbosquid, the SL marketplace offers content for pennies or just a few dollars. I could build the rest. I've no faith that the Lindens would do what it takes to get tiers lower, such as moving to a low-rent neighborhood far from San Francisco's posh restaurants and boutiques. I've no faith they'd focus more staff time on finding out what ordinary SLers, and not just their land-barons, need. 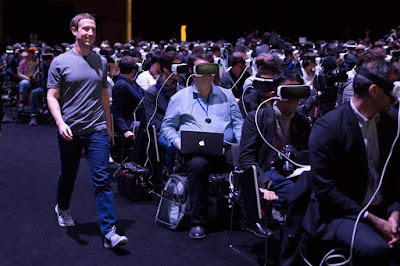 It will be interesting to see what happens as Sansar launches. 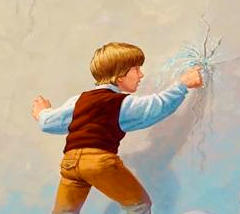 I fear that some SLers are so immersed in the world that they do not see the dyke cracking and the Dutch Boy trying every finger and toe he has to plug the leaks. Then, one day, comes the deluge. VWBPE 2015: Staying the Course! I don't get Iggy into SL much any more, but I decided to pop in to hear about this year's VWBPE Conference, one I attended when I was more active in my use of virtual worlds. This year's conference sessions look really interesting. Sadly, I'll miss it, since I'm going to be participating virtually, via Skype, in the CCCC 2015 Conference for writing teachers that week. 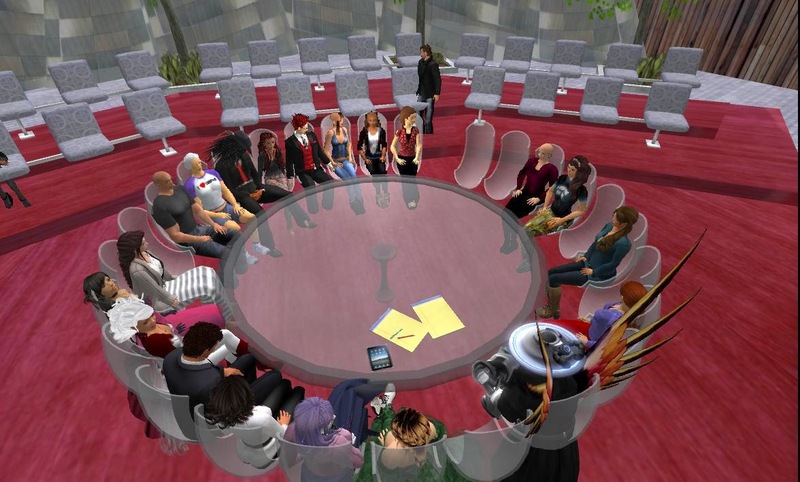 There's some irony there: me presenting via my RL self about work done a few years back in a virtual world. I would love to attend the SL conference, too, but I'd need a clone. The resilience of VWBPE is timely. Just this week, I was at an academic meeting where an article was mentioned by a colleague. The source? Journal of Virtual Worlds Research. It's an indication that these worlds are getting closer to that academic mainstream, for scholarship if not for widespread use. Perhaps that will follow. 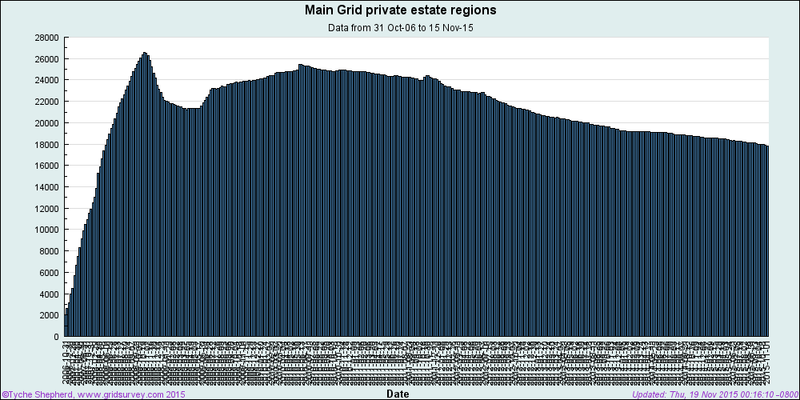 The numbers are trending back down for the number of private regions in Second Life. I cannot speculate about the temporary rebound we were seeing for a few weeks, but soon SL's region count will be lower than its ebb in February 2014. Let's assume, for a moment, that the venture with OnLive's SL Go client, the coming of the Savior called Occulus Rift (praised be His Holy Name), other improvements by Linden Lab, and other efforts by the newly hired CEO do not stem the ebbing tide. What then? Nothing wrong with being a niche. We live in a finite world, the myth that growth is infinite and can continue forever and that triple digit yearly growth is required for 'success' has got to go. There's nothing wrong with finding a niche market and making steady money off of it, year in and out. Other than the limited-population OpenSim Grids or walled gardens like InWorldz and Avination, who DOES what Second Life does? Activeworlds? PC Only. IMVU? Just a chat room with avatars. Cloud Party? Gone. High Fidelity? Still mostly a gleam in Philip Rosedale's eye. Unity 3D? Beyond the scope of most faculty and hobbyist developers. Garry's Mod? Exactly how much technical knowledge does one need to run that thing? 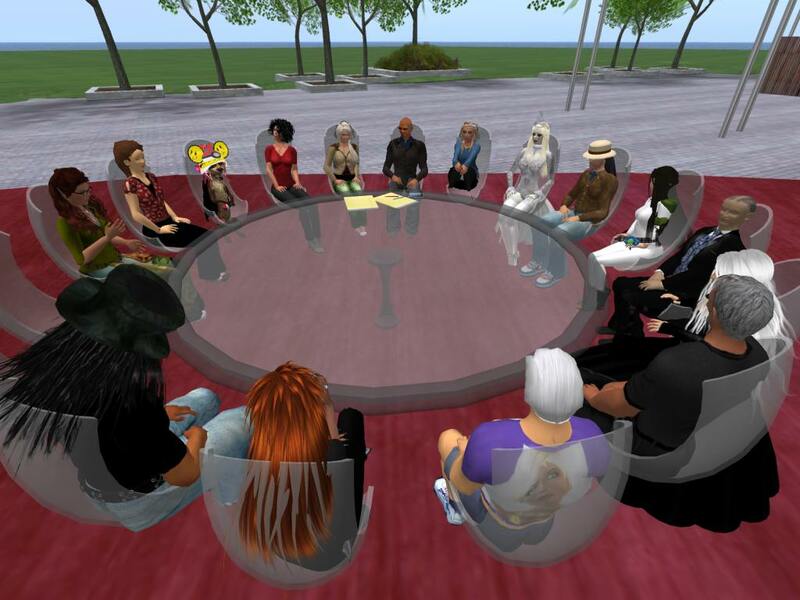 Let me know what else does what SL does: a sandbox for user-generated content that purports to be a metaverse. I'm waiting. That's the brilliance of finding a niche. If only Linden Lab would exploit that. Others do. In renovating a house currently, I found myself completely unwilling to undertake needed work in the crawl space. I have done such work before personally, raking out ruts, putting in a vapor barrier, sealing around wires and pipes, installing subfloor insulation. Most HVAC and plumbing companies--mainstream all--would not touch my latest crawl space for a price I can afford. Enter a local firm called CrawlSpace Ace, whose owner told me that they found a profitable niche, dirty work to be sure, and cornered the market. They do not want for business. Read this thread for contractors to see why, but read it during the daylight hours. You won't sleep well otherwise. So what would Linden Lab have to do to think like a crawl-space contractor? The improvements listed early in this post would help. Then they must retain the loyalists. Eventually, they have to lower tier. All that has been said. 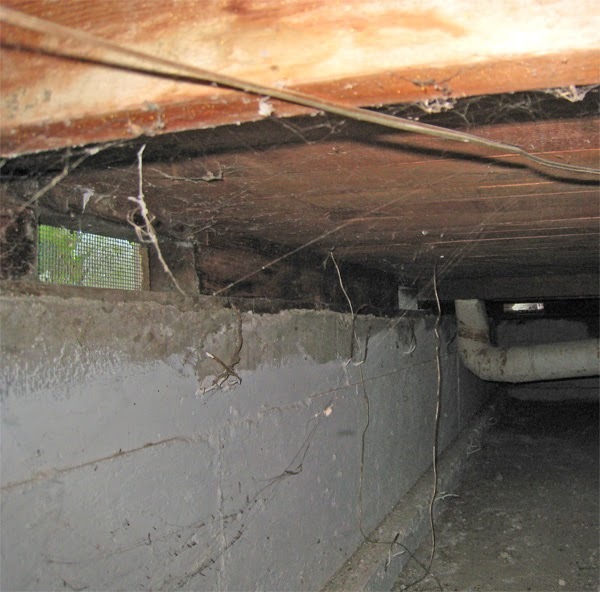 Yet if a crawl-space contractor can make a go of it, an IT firm in The Bay Area certainly can. We are still waiting.